Why it matters that your favorite Christian artist says they don’t want to be called a Christian artist. There seems to be a growing trend among Christian artists who feel the need to clarify to people that they aren’t really “Christian artists”. Some have even tried to point out that a Christian who is a plumber doesn’t call themselves a “Christian plumber”, so why on earth does a Christian, who is an artist, have to be referred to as a “Christian artist”? He did not practice these things in a corner, he did them in public. It was his public actions and testimony before Agrippa that opened the door for the gospel; not recanting his declaration, but glorifying God in that name, as the apostle Peter tells us to do in 1 Peter 4:16. Scripturally speaking, the term Christian is always given by those of the world to believers who follow Christ publicly. In every instance of the word, it is the conduct of Christians which provides those outside of Christendom to label them as such. It is not a name given to believers by their fellow brethren, but a name given to them because they follow the Christ who saved them. This insult should be one that is worn as a badge of honor to our King. If a professing believer does not want to be labeled by the outside world as “Christian”, one has to sincerely ask themselves why? At the center of this controversy is rapper Lecrae and the record label he co-founded, Reach Records. The mission of Reach is “changing the way people see the world.” Their artists and fans rally around Romans 1:16, being “unashamed” of the gospel. The Reach brand was built on music that shared the gospel. Listen to Lecrae’s 2006 album After the Music Stops. If you get through the first song without realizing Lecrae is a Christian, the second track, “Jesus Muzik”, makes it clear. How does one go from labeling their entire movement based on a verse that says “I am not ashamed of the gospel…” to taking the references down from their website and denying that the music they are creating should fall under the genre of “Christian”? While we do not want to judge one’s heart, we have to sincerely ask: why the shift? 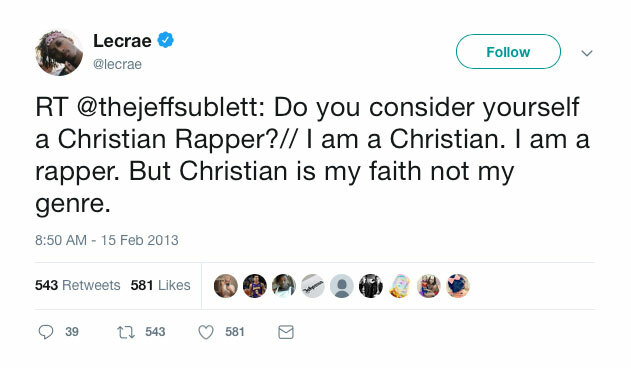 Has Lecrae turned his back on Christ or is he attempting to be less overt so that he may be able to reach a bigger audience? 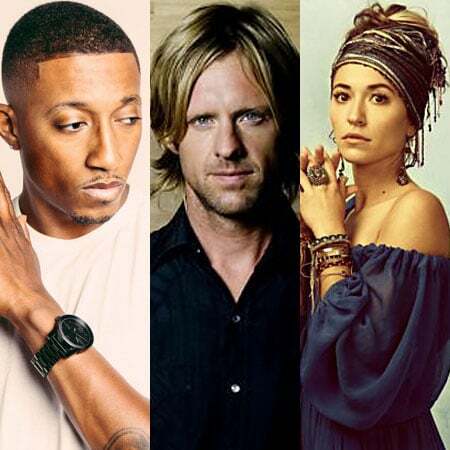 Some musicians have complained that labeling their music “Christian” then implies that a song can be “saved” or “born again” and therefor, since a song cannot be, the song cannot be Christian. But the problem here is that nobody on earth believes such a thing. Nobody believes that a song can be saved. If it is labeled “Christian” it’s because it is glorifying God in a manner that is fitting with Scripture. Just as the outside world labeled early followers of Jesus “Christians”, because their outside behavior reflected that of their Christ, so we also should label music that reflects Jesus as Christian. This is true. One is not more “saved” because they happen to be gifted in the manner of teaching and shepherding, rather than another gift that Christ has bestowed upon them. The apostle Paul explains this quite clearly in 1 Corinthians chapter 12, where he explains that we are all parts of the body of Christ and one party of the body cannot say to the other that they have no use for them. But is there a difference between a “Christian” pastor and a non-Christian “pastor”? Is there a difference between a Christian sermon and one that is taught at a mosque? The identifiable differences are the same as that of a Christian song would have over a non-Christian song. One would be in alliance with Scripture, regardless of the topic within the content. A Christian pastor would also be one that is in accordance with scripture. We can identify that a pastor is a legitimate pastor by looking at his fruit and his teachings to determine whether they line up with scripture. If you are a Christian artist, your songs will line up with scripture whether or not you prefer the label. Much like the early Christians, it is their actions in word and in deed that provided the outside world with the evidence to call them a Christian. If you do not want fellow believers or the world to describe you in such a way, you would have to ask yourself…why? The Bible tells us that the children of God and the children of the devil are obvious (1 John 3:8). It also tells us that believers will have a hope inside of them that requires the world to ask them why it is within them (1 Peter 3:15). We are even told that non-believers will marvel and malign you for not walking in the same dissipations as them (1 Peter 4:3-4). As a blood-bought believer in Jesus Christ, your conduct and hope should cause the unbelieving world to marvel and question why it is that you act the way you do. Why it is you speak the way that you do. Why it is you love the way you do. Why it is you sing the things you do. Being labeled a Christian by the outside world should not be something we run from. Whether you are a plumber, electrician, principal or janitor, if someone called you the “Christian librarian”, it should be a badge of honor that represents the Christ who lives in you. If there was ever a label that someone should call you which encompasses who you truly are, what greater label than one which means “a follower of Christ”? If the outside world believes that this label represents your music, what greater compliment? If the term “artist” represents you better than Christian artist, I have to wonder what it is you prioritize. I’ve been a wrestling coach for 11 years and I will tell you right now, I would much rather be referred to as a Christian wrestling coach than simply a wrestling coach. The way I coach, the way I talk to my wrestlers, the priorities I have concerning the way they leave after high school, are all better encompassed by my Christian faith. It is the very lense in which I coach through, and if the term “coach” better describes me, then I’ve failed as a Christian. Nobody is asking anyone to wave a flag with a cross on it and proclaim themselves a “Christian Artist”. In fact, I would argue that if you had to do that, what sort of content are you putting out? The only concern would be those who would not want their “art” to be associated with the name of Christ. In true Socratic form I ask…why? So the questions are: Are they truly Christians who are artists? Or are they playing at being Christian until they can be artists of the world? Excellent content. Any information on video games?